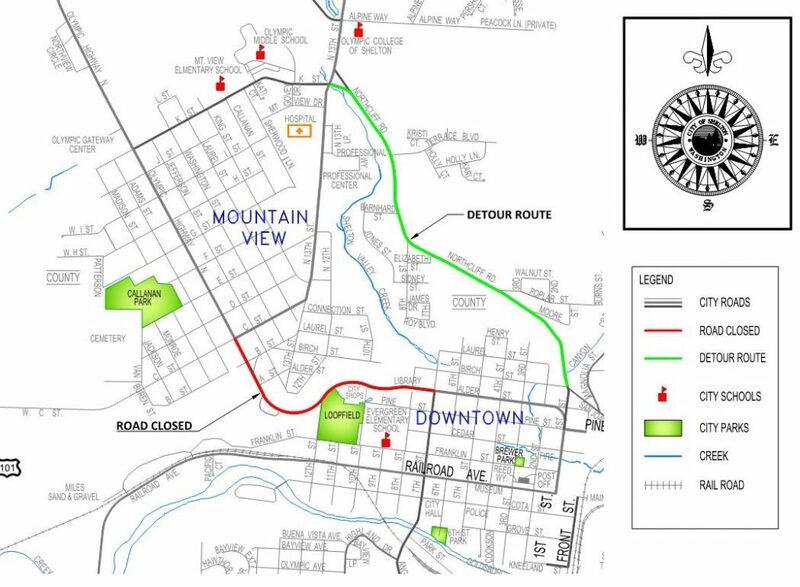 Starting on Monday, June 25th Olympic Highway North will be temporarily closed for construction as part of the Downtown Connector Project. This closure is between 7th Street and West C Street and will last until Friday, June 29th. Crews will be working on a series of stormwater drainage system improvements that will require trenches being dug across the road in various locations. Due to potentially hazardous conditions and the inability to safely cover the trenches with steel plates, the City of Shelton is implementing a temporary closure of the roadway. It is anticipated that Olympic Highway North will reopen on Saturday, June 30th. Please use Northcliff Road as an alternate route next week during the closure. The Shelton Timberland Library will still be accessible from West Birch Street.